And so it came to pass. 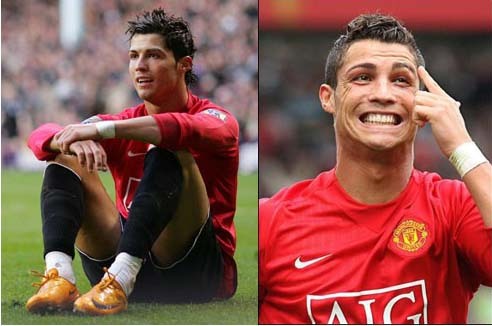 Christian Ronaldo has left Manchester United to join Real Madrid, in a record signing. Despite Sir Alex’s protestations, it was always going to be impossible to hang on to the services of the world’s best player – but we got six great seasons out of Ronny and £80m is not to be sniffed at when the original purchase price was only £12m. Even when you add in all of Ronaldo’s wages from 2003 to 2009, and the fact he helped Man U achieve three premiership titles, one FA cup, two league cups, one community shield, a world club cup and who can forget that magnificent champions league title last year – surely the club still made a profit out of him. When the petulant teenager first took to the field for Man U, I must admit to being sceptical as he tried one to many step-overs in a vein attempt to get past some of the world’s best defenders. It wasn’t always pretty, but as 2003 became 2004, I was starting to believe. The rest, as they say, is history. Ronaldo delivered 118 goals from 292 appearances – most of them spectacular. Not quite the complete player, but still up there with the best of the best. I wish Ronaldo well and hope that his insurance premiums recover after that disastrous manouvre under the runway tunnel of Manchester Airport, that totalled his Ferrari 599 GTB Fiorano. We might forget the red cards, the “spoilt brat” behaviour, knocking England out of the 2006 World Cup and all those embarrasing dives; but we’ll never forget that manbag (see picture).